Hi there, puppy pals! If you’re wondering what the best food for Golden Retrievers is, look no further. 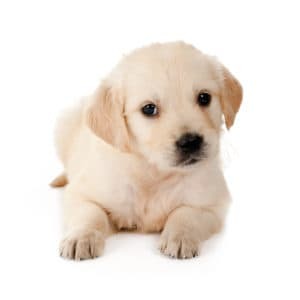 This page is just for you and is jam-packed with Golden Retriever puppy food reviews to help you make the right choice. Large size and relatively high lean muscle mass. Shall we dive right into it? 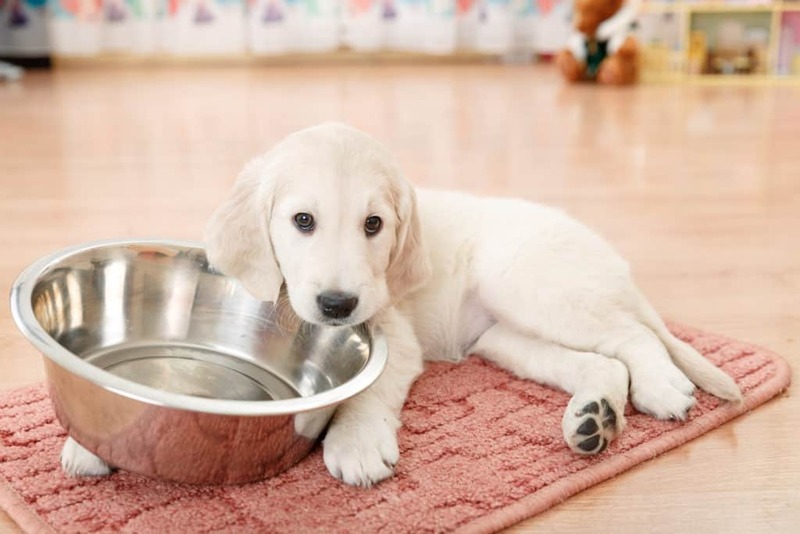 What’s In The Best Golden Retriever Puppy Food? Golden Retriever Dog Food: Wet Or Dry? What Is The Best Dog Food For Golden Retriever Adults? Is there a Golden Retriever puppy food with salmon? My pup finishes her Golden Retriever Food really fast…why? 21% protein – great for Golden Retriever adults. DHA in here for optimal development of one’s eyes. Royal Canin – Known for their breed-specific puppy chow, Royal Canin have crafted a mouth-watering (and anti-oxidant rich) Golden Retriever food. Let’s take a peek at how the protein, fat, and calorie ratios should stack up in the best Golden Retriever puppy food. If you’re ever in a pickle and can’t decide between two brilliant Golden Retriever foods, here’s how you can make an informed choice. First up, start with the protein content of the food. Golden Retrievers are lovable, playful, active large dogs, so they need enough protein for lean muscle development. As they will need to get this from their food, the number one ingredient should be meat. Have a look at the ingredient list, a good Golden Retriever puppy food should have — at the bare minimum — at least 22% protein per serving. Alongside this, they are likely to need around 13% fat and anything from 1800 to 2500 calories every day. It always helps to look use an online dog food calculator. When it comes to minerals and vitamins, there’s no hard and fast rule. The healthiest way to ensure that your Golden Retriever is getting enough vitamins is to choose a brand that is AAFCO approved for puppies or adults. For little ones, this will be any food that provides a complete, as well as a balanced formula for growth or development. For adults, scout out AAFCO-approved blends for maintenance. For adults, make sure that your sidekick is getting between 18-28% protein. The amount of fat that you feed him or her will depend on how much exercise your dog is getting. It’s a large protein range, we know, but the rule of thumb is that the more active your dog, the more protein he needs to rebuild or grow his muscles. According to the NRCNA (National Research Council of the National Academics), an adult Golden Retriever will require between 1,350 and 1,750 calories daily if he’s getting lots of exercise. This could drop to a much lower figure (as low as 980) if you’ve got a smaller, female, and/or relatively inactive dog. You may want to make an exception, of course, if you’ve got a Golden Retriever who’s on a special diet — check our Sensitive Stomachs page if this describes your pet. As silly as it sounds, the answer to the “Wet or Dry” dog food question is “Wet OR Dry!” To be more specific, feel free to alternate between the two as you see fit. To help you with your decisions, here are a few pros and cons of each. Wet Golden Retriever Food typically comes in cans, or in big packs of cans (which can be better value). It offers more moisture to your puppy or grown dog, and this is a good thing if you’ve got a canine counterpart who doesn’t tend to drink lots of water. While it costs more per unit than dry kibble, wet food is a fabulous way to keep things exciting for your dog. On the downside, you’ll need to start keeping tabs on when you opened the food and how long it will last in the refrigerator. This information should be provided on the side of the can. If you’re after a dog food that lasts longer once opened, dry kibble is the way to go. Unless you’ve got a very clever little puppy who can get inside, this is generally safety stored in the pantry. It will last much longer once you’ve opened the packaging, and in general, dry dog food is a more economical choice than wet. If you’ve ever fed a puppy dry food only for a long time, you’ll know how exciting wet food is. In most cases, it’s because variety is more interesting than the same old kibble day after day. It’s also often down to the fact that wet food smells stronger, making it more enticing for your fluffy friend. The point is that, just like humans, your Golden Retriever may appreciate a change, and it can be a thoughtful way to show your pet that you care about them. Should you want to switch up wet and dry dog food — for whatever reason — you can easily do this by looking at the manufacturer’s instructions. 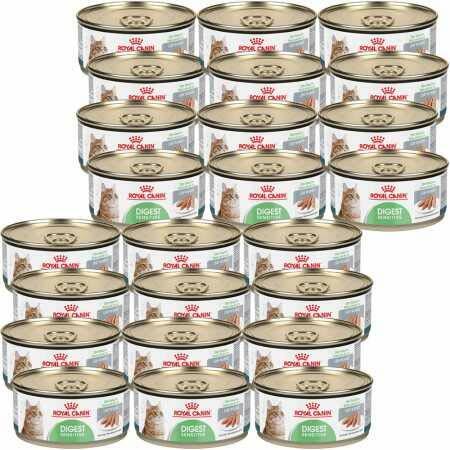 They will generally give you guidance on how much to sub for each unit of wet or dry food. As with other larger puppy breeds, Golden Retrievers require nutritious meals that are designed to be fed for longer periods. Why? Because larger dogs usually need significantly more time to reach their full grown-up body mass. When shopping online, keep your eyes peeled for formulas that can be fed for anywhere up to 14 months. Rarely, but sometimes, they may take a little longer to grow. Here are our nominees for best Golden Retriever puppy food. You’ll find DHA in here for optimal development of your little one’s eyes. 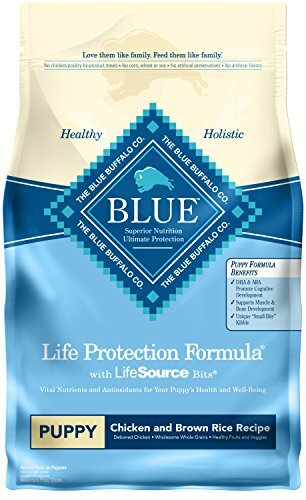 There hasn’t been any glucosamine added into this Blue Buffalo formula, as far as we can tell. What do we love about Blue Buffalo? All its Life Protection Formula products (whoops, doggy meals!) are free entirely from any form of poultry or chicken milled by-product. Those grain-free pups are going to love this wheat-free crunchy kibble, and they’re going to adore the fact that it’s made with zero maize or soy. Here’s one from the well-established Royal Canin—a favorite with pet owners across the nation. It’s formulated to meet all the needs and requirements of your little pure breed Golden Retriever puppy, thanks to its special kibble design and antioxidant content. 27% protein is a super amount for developing those lean muscles. If you’re steering clear of all by-products, you’ll want to know that this Golden Retriever puppy food does contain some. 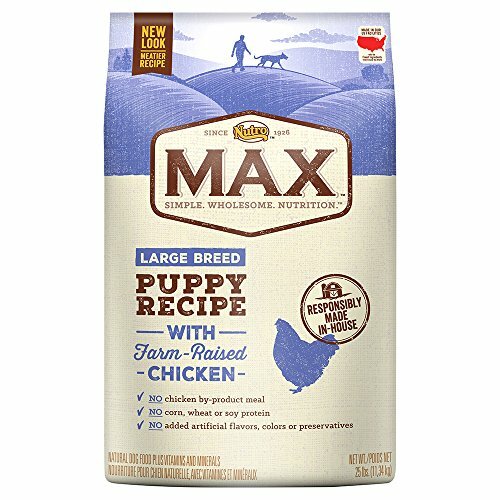 As noted, this is the best dog food for Golden Retriever puppies because it has the Omega antioxidant content to keep their beautiful coats all soft and shiny. These also play a pivotal part in assisting your little one to fight off diseases and get started with a strong, resilient immune system. 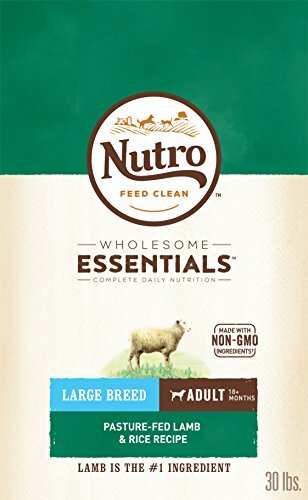 We loved the Nutro Large Breed blend for grown-ups, and we are big fans of the puppy chow, too. No surprises there! Nutro Max has made a name for itself as one of the top dog food brands around, for protein-packed dinner times as well as tasty treats. In our humble opinion, it also makes the best food for Golden Retriever puppies. Another nice dose of all-natural protein from vegetarian chickpeas. The only downside for us is that there aren’t loads of leafy veggie greens. A delicious, AAFCO-approved meal of hearty chicken and lovely natural ingredients. If you’ve been reading the nutrient list, you’ll see that there’s even some green tea extract in the recipe for antioxidants. If that cute little puppy has blossomed into an equally cute — but much larger — adult, it’s time to worry a little less about regular mealtimes. While proteins and fats are still going to be at the heart of your best friend’s diet, they’re going to need a little less of it in relation to everything else. The good news is this means more room for all the mineral, antioxidant, and vitamin goodness of veggies in their food. 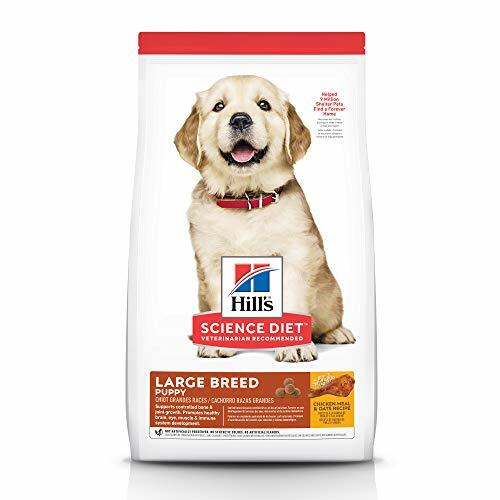 Hill’s Science Large Breed. We’re big fans of this Golden Retriever food because it is a great source of chondroitin (and don’t forget glucosamine). That is, big dogs are heavy, and they need strong joints to support their weight. You’ll find the recommended veterinary amount for maintenance in this dinner. Apples, as well as other lovely veggies, abound, giving your buddy a natural boost of vitamins. Gluten or grain-intolerant Golden Retrievers won’t be able to eat this, as it contains some wheat. Well, we haven’t tried eating it ourselves, but the canine members of our team seem to love it! We like that it’s got healthy natural nutrient sources, and added Vitamin E for lovely coats is an awesome touch. Big dogs have big appetites. While serving size is always something to be aware of, it’s always great to know that your hungry, fluffy friend is eating good food. And Wellness Complete is a fantastic dinner or breakfast option, being free from oh-so-many of the things we dog owners often try to avoid. Spinach and carrots are just two of the many lovely farm veggies in this formula. If you prefer a 100% grain-free Golden Retriever food, this does contain barley and rice. This is a recipe that’s been scientifically designed for all our big dogs. With ideal protein levels and fewer calories from fat compared to Wellness Puppy food, it’s among the very best food for Golden Retrievers. Nutro make super-healthy products, and amongst them, you’ll find some of the best food for Golden Retrievers. Using natural chondroitin and naturally-sourced glucosamine, this dry kibble helps to maintain high levels of joint function in your adult dog. 21% protein, which is just great for Golden Retriever adults. Nope, we adore this Golden Retriever dog food! If you like making sure that your dog gets different flavors at dinner time, as well as varied proteins, this is a top pick. With oatmeal for soft digestion, it’s among the best dog food for Golden Retrievers who have sensitive tummies. Yes, absolutely! 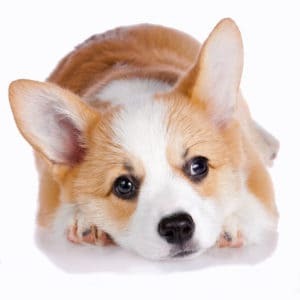 If you are looking for salmon because it’s a ‘novel’ protein, check out our page on the Best Dog Food For Puppies with Sensitive Stomachs. Salmon is an Omega acid-rich source of meat for your little one, and often delivers all the benefits of chicken or beef without triggering a reaction. If you’re simply after something that’s a nice change, or you’re trying out rotation-based feeding, head over to our ‘Brands’ page. Just a few of the many brands that offer a wide variety of ingredients include NutriSource, Fromm, Merrick, and Blue Buffalo. 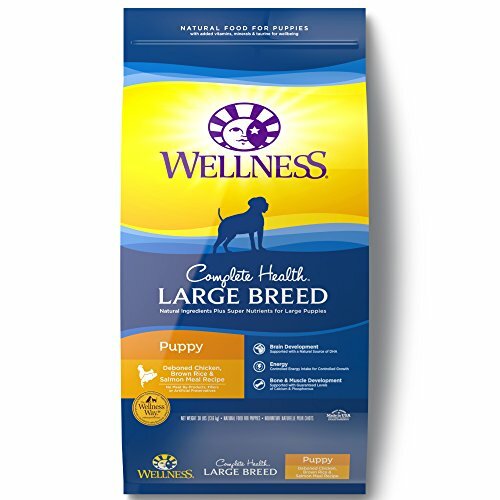 Because you’re looking for a Golden Retriever puppy food, you will want something that has been designed for large breeds. Hope this helps! Good question. It’s not at all uncommon for puppies to eat a lot faster than we do. In fact, it’s a very popular question. If you’ve noticed your puppy gulping down his or her dinner in just a few minutes, you may also have found that it can quite often lead to hiccups or burping. Don’t be alarmed, there are several ways to prevent this from happening. Our advice is to try a puppy food with specially designed kibble. Some of the best dog food for Golden Retrievers has a kibble that is shaped and textured to encourage chewing. This helps your dog eat slower, and will usually mean less gulping behavior.